OTTAWA - More than a year after Maryam Monsef revealed she was not actually born in Afghanistan, as she had previously believed, the Liberal cabinet minister is still waiting for the government to update her documents. "Just like everybody else, I'm waiting my turn," the status of women minister said in an interview with The Canadian Press last week. 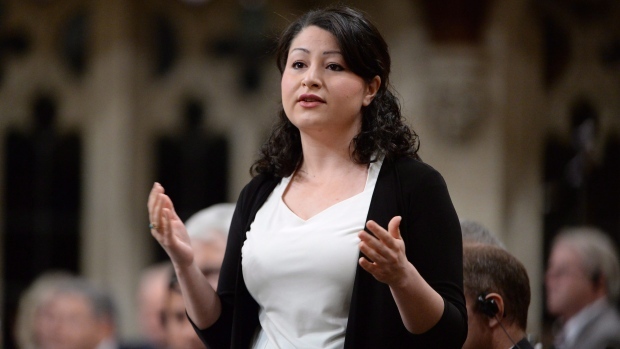 In September 2016, the Globe and Mail reported that Monsef, hailed by the Liberals as Canada's first Afghan-born MP, was actually born in Mashhad, Iran, a city about 200 kilometres away from the border with Afghanistan. At the time, Monsef said her parents fled Afghanistan as the security situation there deteriorated and that after her father was killed, her mother never discussed what the minister described as the unspeakable pain of those early years - until media inquiries prompted Monsef to press her for details. "She told us she did not think it mattered," Monsef said in a September 2016 statement. "We were Afghan citizens, as we were born to Afghan parents, and under Iranian law, we would not be considered Iranian citizens despite being born in that country." Monsef, who had listed her birthplace as Herat, Afghanistan, when she applied for a Canadian passport, promised she would take steps to fix the error. Since then, she has submitted documentation to Immigration, Refugees and Citizenship Canada, but is still waiting for a resolution. "There's just nothing to tell," said Monsef, who made it clear she did not wish to be questioned about it further. "I'm as Canadian as you are. The paperwork is done and when there is news, I will be sure to share it with you." Celia Canon, a spokeswoman for Monsef, did not answer follow-up questions about the matter, including whether Monsef was still travelling on a passport containing erroneous personal information. The Immigration Department would not comment specifically on her case, citing privacy reasons, but did outline the potential steps involved should someone need to correct their birthplace on their passport. "The passport applicant must indicate the same place of birth that is on their birth certificate or citizenship document," departmental spokesman Remi Lariviere wrote in a emailed statement. "If there is an error in these documents, they must be corrected before submitting a passport application," said Lariviere, noting the applicant would not be eligible to use the renewal process, and would instead have to make a general application. Immigration lawyers say lengthy delays would not be surprising for such a complex situation. Jamie Liew, an assistant law professor at the University of Ottawa, said given the high-profile nature of the case, government officials might be going above and beyond the usual due diligence, or it could be simply be bureaucratic delay. "It's all speculation, but it isn't uncommon for cases to take a long time to come to resolution," said Liew, who specializes in immigration and refugee law. Monsef's mysterious origin story raised eyebrows when it first emerged, in part because at the time, the Liberal government was still aggressively enforcing a Conservative law that could strip naturalized Canadian citizens of their status without a hearing, despite having campaigned against it. Immigration lawyers have pointed out that if her place of birth was also misrepresented on her refugee claim, and subsequently on her applications for permanent residency and citizenship, it could be grounds for revocation of citizenship - even if it was the result of an innocent mistake or the fault of her mother. "There is discretion and it's hard to imagine that would happen in her case, but clients of ours that are maybe less advantageously positioned, they would be vulnerable to that," said Daniel Kingwell, an immigration lawyer based in Toronto. Misrepresentation remains grounds for being stripped of citizenship, but following the outcome of a Federal Court case earlier this year, the government brought in an appeals process that will come into effect in early 2018. "I think in this case, obviously, they're going to have to make a political decision in addition to a regular administrative decision they would make on whether to pursue a case such as this for misrepresentation," said Toronto-based immigration lawyer Aris Daghighian. Peter Edelmann, an immigration lawyer based in Toronto, said politics aside, he does not think investigating Monsef's case would be given high priority. "It doesn't sound like it was a particularly material misrepresentation," Edelmann said of Monsef, whose family came to Canada as refugees in 1996 after having fled Afghanistan once the Taliban came to power in Herat, where they had gone back to live at the time. "It's not like she came in under an assumed identity and hid her war crimes on the way into Canada."